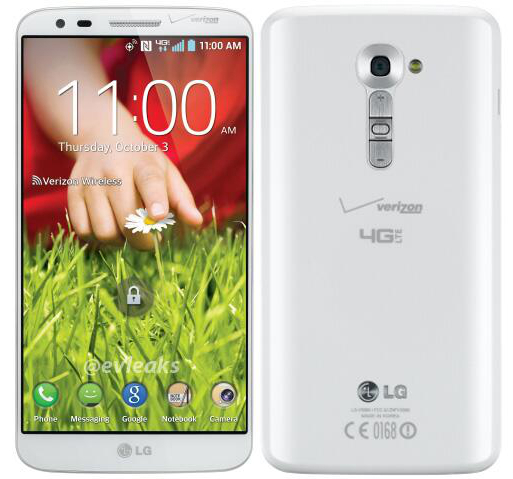 Late last night, @evleaks posted up a leaked press render of the G2 from LG in White. The device has Verizon branding all over it, and from the previous information we posted back on the 7th, we could possibly see this device hit Big Red’s network this Thursday, November 14. Besides this white exterior, which we find quite appealing, this features all of the same internals as the black variant. The G2 sports a gorgeous 5.2″ 1080p display, Snapdragon 800, 2GB of RAM, 13MP with full OIS technology built in. It’s still a great buy, for sure. When the G2 hits Big Red in White, will you be grabbing one?